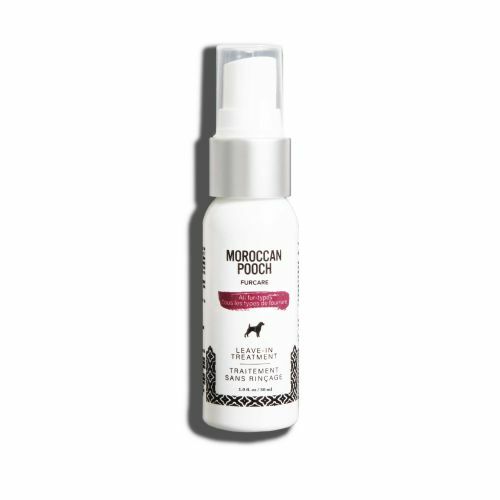 For a quick pick-me- up, spritz and comb on to dry or damp fur from root to tip. Perfect to use in- between pampering rituals. Use once weekly. Our natural weightless mist gives fur an effortless look. INGREDIENTS: Distilled Water (DISTILLED WATER), Argania spinosa kernel oil (ARGAN OIL), ethylhexyl palmitate (FATTY ACID), isopropyl palmitate (COCONUT OIL BASED EMOLLIENT), hydrolyzed keratin (KERATIN HYDROLIZED), polysorbate 80(NONIONIC SURFACTANT & EMULSIFIER), glyceryl stearate(ORGANIC EMULSIFIER), PEG-100 stearate (MADE BY COMBINING NATURAL OILS & STEARIC ACID), Fragrance (NATURAL SIGNATURE FRAGRANCE), behenyl alcohol(EMOLLIENT & EMULSIFIER), guar hydroxypropyltrimonium chloride (ORGANIC CONDITIONING AGENT), Rosa canina fruit oil (ROSEHIP OIL), dihydroxypropyl PEG-5 linoleammonium chloride (CONDITIONING AGENT), hydrolyzed silk (SILK HYDROLIZED), Vanilla planifolia fruit extract (VANILLA EXTRACT), Rosmarinum officinalis leaf extract (ROSEMARY), hydrolyzed wheat protein (FUR & SKIN CONDITIONING AGENT), hydrolyzed wheat starch (SKIN CONDITIONING AGENT), disodium EDTA (PRESERVATIVE), citric acid (DERIVED FROM CITRUS FRUIT), sodium hydroxide (PRESERVATIVE), tocopheryl acetate (VITAMIN E), pentaerythrityl tetra-di-t-butyl hydroxyhydrocinnamate (ANTIOXIDANT), benzyl alcohol (SOLVENT), glyceryl Laurate (SKIN CONDITIONING & EMOLLIENT).